Brunch is my favorite activity. I have a developed skill set for brunching on the weekends. I’ve seen it all, I expect it all. But nothing could have prepared me for this. Many Chicagoans know about you, The Southern. Nestled in the hip and trendy Bucktown, you do all the food things that food people love to see: Fresh and local ingredients, high-quality craft brews and cocktails. You combine the best of southern living with a big city twist. So, I was ready for the wait. I was ready for the one-page brunch menu (because why not make a few things really well instead of 100 things mediocre? ), but I was not ready to want every single item on that one-page menu. Sometimes, I don’t have the energy to change out of my sweatpants. There’s just no reason for it. But that gets in the way of venturing out for my favorite weekend meal: eggs Benedict (see here, here, here, here, here and… well, you get the picture). The only solution is to make them at home. Luckily I anticipated this lack of energy (I mean, it’s Saturday), this inability to get out of sweatpants, and picked up a few essentials at the store earlier in the week. The process was surprisingly easy and there was absolutely nothing lacking in this weekend homestyle brunch. The breakfast potatoes just needed to sit in the oven for about 30 minutes before they were crispy on the outside, soft on the inside and salty to perfection. I’m no expert, but a quick Google search taught me some tips and tricks to the perfect poached eggs, which fit lovingly onto the English muffin (which I put in the toaster) and Canadian bacon (which I warmed in a pan). And three cheers for me for making homemade Hollandaise sauce for the first time ever (blend egg yolks with lemon juice, cayenne and butter)! With my trusty girl Cholula on hand, the clouds parted and the sun shone brightly onto the glorious breakfast table. Even though the steps are individually simple, it still takes a little bit of time. Then again, it’s probably the same amount of time it takes to get up, get ready, go to a restaurant, sit and order. And in the homemade situation: Hello! Sweatpants! While I wish I had enough time to make this for breakfast every morning, I’m glad I don’t. I can preserve the specialness of this meal (and of course, still go out for brunch). Poached egg, Cholula, Canadian bacon and breakfast potatoes… but all made at home! Extra, extra! 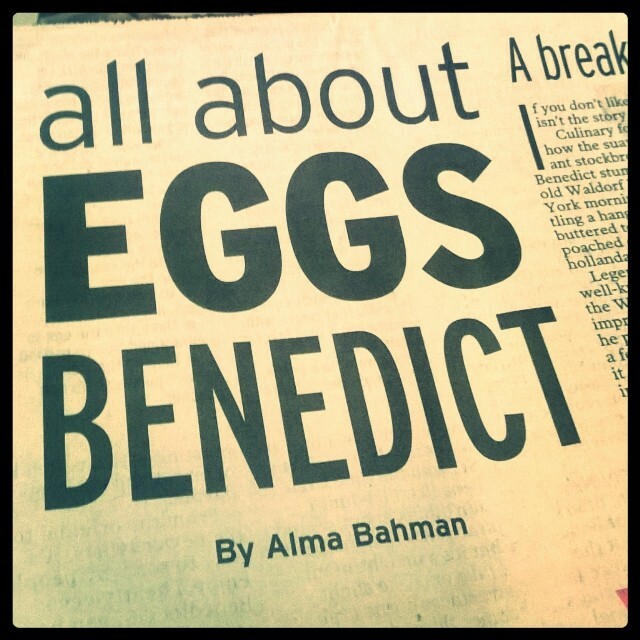 Read all about eggs Benedict! It’s been a quiet week for me here at DF, not because I haven’t been eating (preposterous thought) but because I’ve been working on a food story. Better yet, the food story is for the Lawrence Journal-World, where I work. My editor noticed my (somewhat unhealthy) obsession for this breakfast food (here, here and here) and suggested I write something. 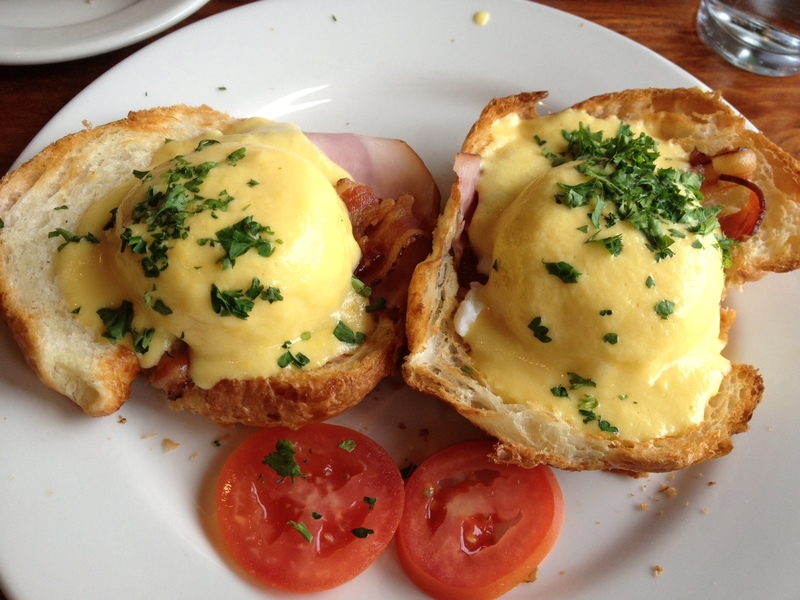 Go around town and try all the eggs Benedicts I can? Chat with people about its deliciousness and brunch history? It seemed insurmountable to express my love in such a manner but I did it. Take a look at the story here. Surprise, surprise: Alma got eggs benedict again. I’m thinking I may need to do an eggs benedict special section at some point in the future. I just love them so much! Anyway, this meal came from the Cork | Fire Kitchen, part of my Temecula adventure over winter break. It could help that it was a gorgeous day, not a cloud in the sky with uber comfy couches at the table and a beautiful golf course spread out to my right. Or maybe it was the amazing combination of melted cheese on fried potatoes. Either way, it was a heavenly breakfast on a heavenly day. So the orange spice fritters were just the beginning. 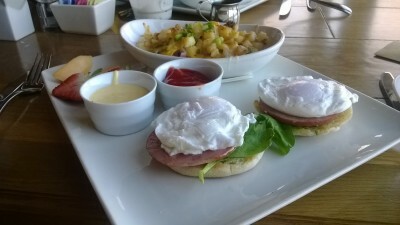 As a breakfast lover, I tend to judge a restaurant by its eggs benedict, but I had no doubt in my mind that Bluestem would pass with flying colors. And that’s all I have to say about that. Needless to say, I’m on a Benedict rampage. And I like it. My first venture into Kansas City, Mo. led me to The Farmhouse where breakfast is king. I need to go back, pronto. Eggs on ham on challah? Genius. It’s a travesty that all eggs benedict do not come atop a croissant. A crime, actually. La Madeleine must have read my mind because truth is, I’ve been dreaming of a breakfast this perfect since I could speak. Usually, ordering eggs benedict means two out of three things will be good: the egg, the hollandaise sauce, the toast or muffin it comes on. Lucky for me (and the world), La Madeleine gets all three right. The eggs were poached just right, the hollandaise sauce perfectly creamy and lemony, and the croissant…ohhhh the croissant. So flaky. So buttery. It was made for eggs benedict. 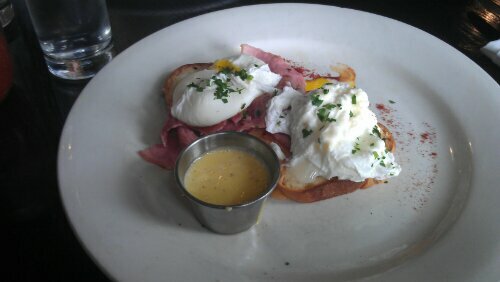 And this eggs benedict was made for me. If you’re lucky enough to be in the vicinity of this cafe, you can’t get there fast enough. Run to the eggs benedict. Run! And then bring me an order.